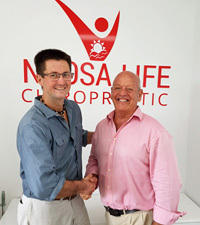 We’re excited to announce that Dr Mathew O’Keeffe is joining the Noosa Life Chiropractic and Massage team! Well-known in our area, Matt was the previous owner of Tewantin Chiropractic and X-ray Clinic in The Atrium, just below our new location. He took care of many community members for several years and is familiar to colleagues in the chiropractic and medical profession all over the Sunshine Coast. With a reputation for excellence, Matt prides himself on listening to his patients and working quickly to get you out of pain and restore you to optimal health. With an interest in healthcare, chiropractic was a natural choice for Matt. He experienced sports injuries as a teenager and chiropractic had long been a part of his life by the time he decided to make it his profession. He began a six-year journey to earn a master’s degree in chiropractic. A shocking event, however, sidelined his dreams. He was viciously attacked and left with head injuries. The doctors told him that his university days were over, but Matt refused to accept it. A year after intense rehabilitation and chiropractic care, he made a triumphant return to his chiropractic education. His trauma allows Matt a unique understanding to the upheavals that injury can cause in his patients’ lives. With many different skills learned over the years, Matt can assist in managing your injury and returning you to an improved state of health as he did, encouraging and supporting you along the way. “Matt brings a fresh and likeable enthusiasm to our practice. He holds a current Medibank Provider number for your private healthcare rebates, an X-ray licence and is experienced and well-versed in diagnosis and the latest in treatment methods. Matt is looking forward to seeing some of you for the first time and welcomes his previous clients to meet the Noosa Life Chiropractic and Massage team. Contact us today to book your time with our knowledgeable, skilled staff!